A local utility construction company is currently working on a utility repair project within a commercial facility in Syracuse, New York. 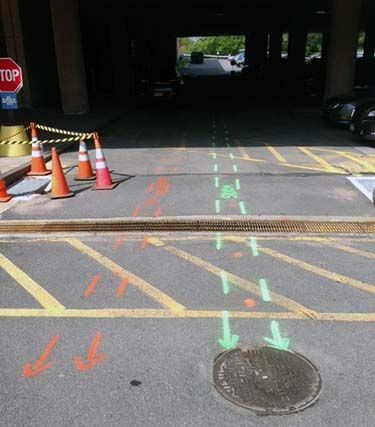 Prior to beginning the required excavation needed to repair a collapsed storm drain, the facility maintenance department wanted to pinpoint the exact path the drain lines running into the drain ran so they could avoid damaging them as well. They also wanted to make sure there were no other local utility lines running through the area so they could avoid striking them while the digging was taking place. Ground Penetrating Radar Systems, LLC. was referred to the department by other contractors that knew they not only had the ability to locate the utility lines, but to also provide their respective depths beneath the surface. The maintenance department decided to give GPRS a call and was pleased to hear he was available to complete the project well within the needed time frame. Jim Bell of the Upstate, New York office mobilized to the site and began marking out the drain lines, as well as the other utility lines in the area. In addition to utility locating Ground Penetrating Radar Systems has the ability to locate and map out underground storage tanks, rebar, post-tension, and conduit prior to saw cutting and trenching, and in some cases unmarked graves. If you have need of any underground imaging services please contact our Upstate New York office, which serves the Buffalo, Rochester, Syracuse, Corning/Elmira, Binghamton and Albany areas, as well as all of the areas in between. If you are interested in obtaining more information or a quote please contact Jim Bell at (315) 715-5137 or jim.bell@gprsinc.com.